Traipsing about China alone (gasp!) - without the aid of a tour guide or package travel deal - is both possible and immensely liberating. We did a group tour of China in 2010, traveling to Bejing, Xian, and Shanghai in a whirlwind 10 days. The agenda was packed tight and we were shuffled from site to site with zero free time. We could not choose where or what to eat and we were routinely subjected to coerced shopping masquerading as "cultural experiences" (jade, silk, pearls...); a large portion of Chinese tour guide income is derived from sales commissions. Traveling independently, however, is a far more rewarding experience! 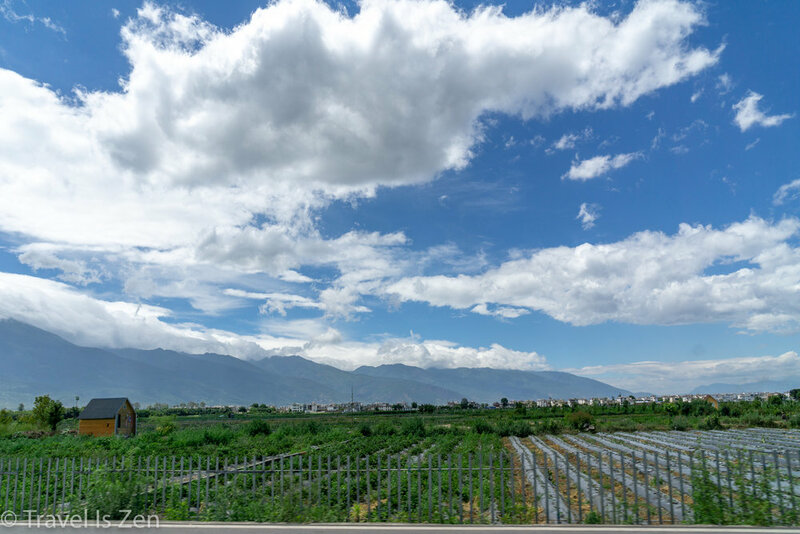 From our initial base in Kunming, we took an overnight train to Dali to begin our 10 day tour of western Yunnan Province, including Dali, Lijiang, Shangri La and a 3-day trek at Tiger Leaping Gorge. In 1000 A.D., Dali was one of the 13 largest cities in the world. It was a prosperous town on the Tea Horse Trade Route connecting Yunnan and Sichuan Provinces with Tibet. The Kingdom of Dali was sacked by the Mongols in 1250 and the city was destroyed. Dali was rebuilt by the Ming dynasty in the 1400's. For several hundred years, influenced by trade with India and Burma, the area became significantly Muslim. The Hui Muslims joined a rebellion by ethnic minority groups in Yunnan province in the 1860s, which was effectively quashed by the Manchurians, decimating the Hui Muslim population. Today, the region is predominately Buddhist. We rented an electric scooter and cruised the Western Ring Road around Erhai Lake, sun beaming warm on our shoulders. Yunnan Province is home to nearly two million ethnic Bai, with a large concentration in Dali. We drove through small Bai villages, with their white, u-shaped homes decorated with black tile paintings, intricate wood carvings and marble sculptures. Bai people have an affinity for white. Here in Dali, white is a fashion essential! Ethnic women, tourists in rented Bai costumes and beaming brides wear white dresses and adorn themselves with brightly colored tribal accouterments. It's all about the selfie! China has a rating system for its tourist attractions; the Dali Three Pagodas rank among the top with a AAAAA rating. It also has a $$$$$ entrance price. Not realizing the immense size of the temple complex, we had allocated only one hour to tour the pagoda and monastery. Rather than short-change the experience, we chose not to pay the $45/pp entrance fee and instead just snapped a few exterior photos. Dali travel tip: allocate at least half a day to tour the Three Pagodas site. And, while you're at it, allocate more than just two days in Dali! 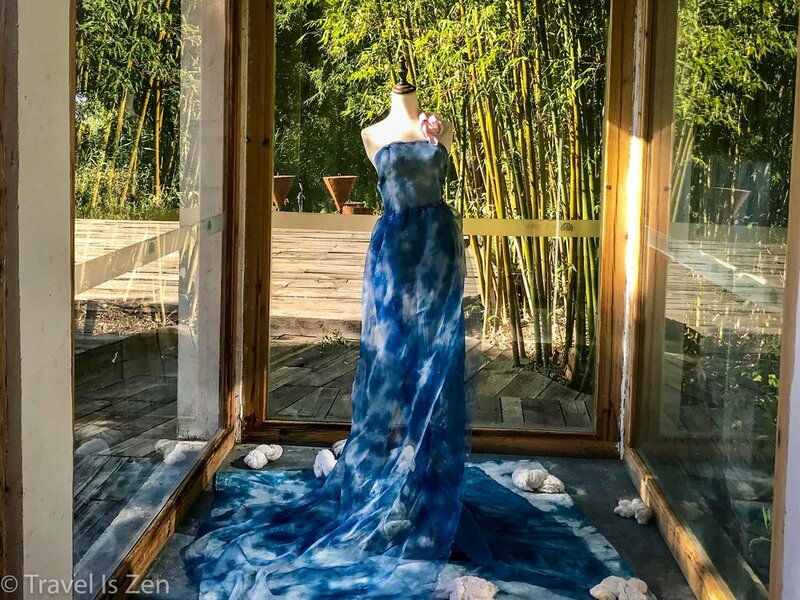 We could have spent at least two more days hiking in Mount Cangshan, boating on the Erhai Lake, stuffing ourselves with mushroom hot pots, relaxing in tea shops, and trying out indigo tie-dying. Live and learn. A four hour bus ride took us to Lijiang, even higher on the Tibetan plateau at around 8,000 feet. Like Dali, Lijiang also has a long history as a large and wealthy trade city on the Tea Horse Trade Route. During the period of Mongol Yuan Dynasty (1271 - 1368), Kubla Khan based his reign in Lijiang. Lijiang is another "Ancient Town", carefully regulated to preserve its historical character. 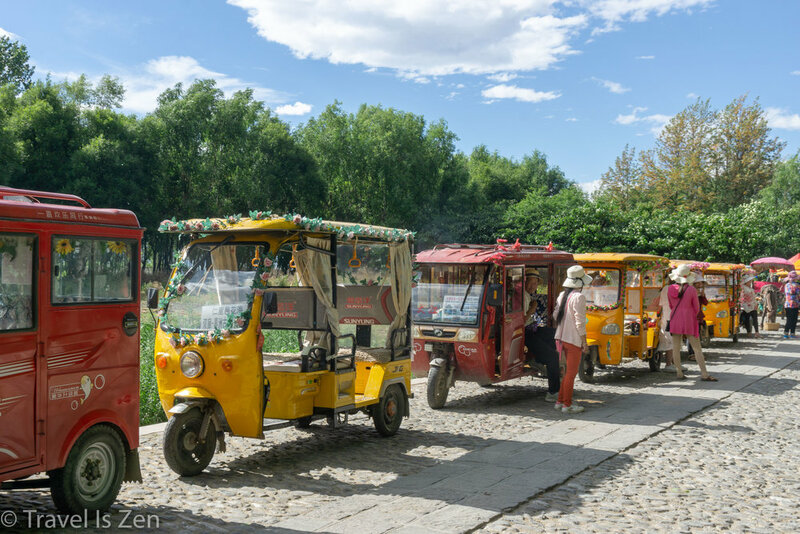 In our opinion, Lijiang lacked the cultural and historical authenticity of Dali. Clean, beautiful, and designed for tourism, it had more of a new and sanitized "disney" feel to it. 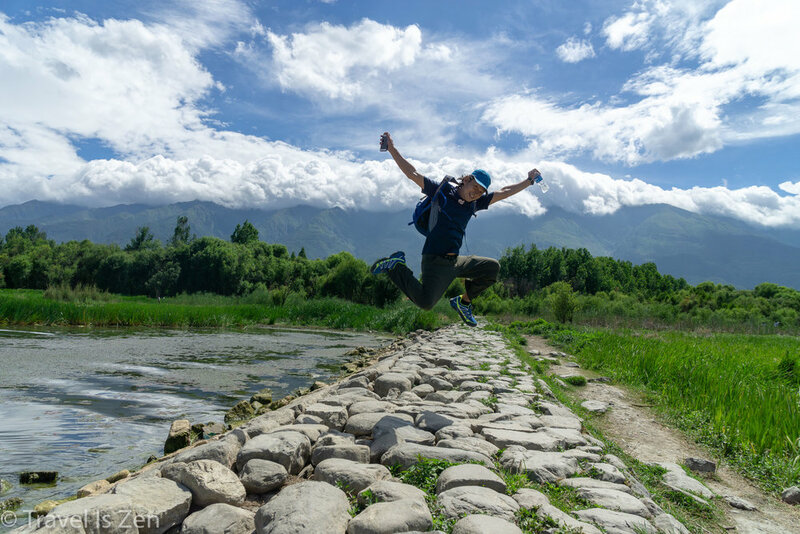 It's a nice place to stroll, eat and shop and there's an artsy vibe, but the real fun lies in the mountains that surround Lijiang. We were just here for one day before heading to Tiger Leaping Gorge for a three-day hike. The primary attraction in Lijiang Old Town is Black Dragon Pool in Jade Spring Park, where there is supposed to be a magnificent view of Jade Dragon Snow Mountain. Unfortunately, rain clouds obscured the scene the day we were there. But we did stumble upon an excellent photographer's exhibit within one of the buildings of the park. We also watched a public performance by the Naxi ethnic group residing in Lijiang. AND, a little piece of my heart is still waiting at the finish line to cheer the winner of the 100km endurance race taking place the day we were there. He or she deserved a hearty roar from the crowd because it was unusually hot and humid that day! The town definitely has character, but you need to wander a little to find it. After our trek at Tiger Leaping Gorge, we spent several days relaxing at a 10,000 foot elevation in Shangri La (formerly known as Deqen). Shangri La feels like mini-Tibet... and to us, it felt very much like the Tibetan refugee areas of Nepal on the Annapurna Circuit. Calm, relaxed, with friendly smiles for all. We were in Shangri La at the start of the rainy season and there were very few tourists. 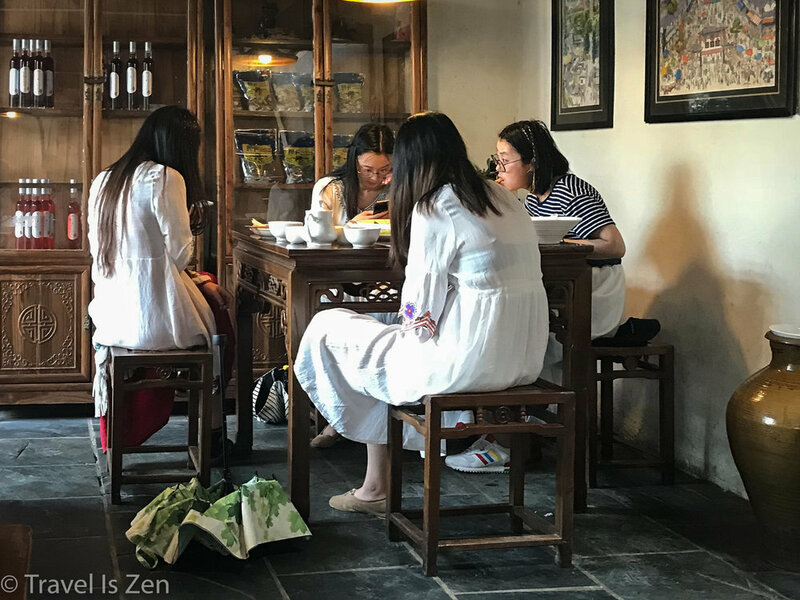 We enjoyed the city at its most relaxed - kids playing in the streets, women gathered around low tables making dumplings, men putting the finishing touches on new construction in preparation for the mid-summer tourist rush. In the evenings, group dancing occurs at sundown in the town square and everyone is invited! We loved this town so much that we extended our stay a few extra nights! Nearly three-quarters of Shangri La's Ancient Town area was burned to the ground in 2014. They are still rebuilding. Like Lijiang, the town has a new feeling, rather than ancient. But you still get a sense of its historical character. The most iconic attraction in Shangri La is Songzanlin Monastery, also known as Ganden Sumtseling Gompa, built in 1679. Gold gilded rooftops gleam against the green backdrop of Foping Mountain. The trail around the wetlands lake area provides the best views. Shangri La travel tip: The month of June is rainy in Shangri La. We were there at the end of May and the rains were just starting. We had some dynamic weather; good for photography! But carry an umbrella if you are visiting in late Spring. Best food we had in Shangri La was at the Tibetan Bhutan restaurant show below. The dishes were well seasoned; not fiery hot. And you can watch the crowds on the street below. Getting around China by plane, bus, and train is fast and inexpensive, but it does take advance planning and a dash of patience in the beginning. You also have to get over the creepiness factor of realizing that your every move as a foreigner in China is meticulously recorded. 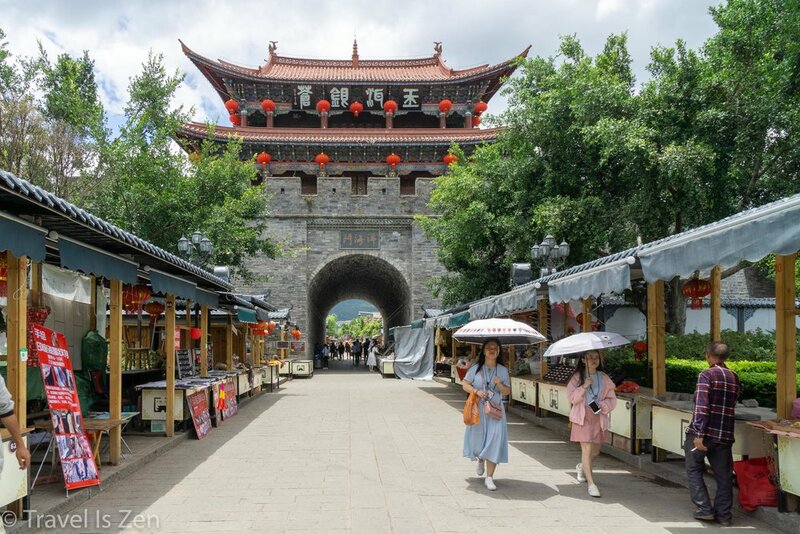 In preparation for our tour of western Yunnan Province, we discovered that our passports needed to be registered with the train station authorities and our booking site login profiles authorized before we could buy train tickets online. We rode a city bus to the Kunming train station and mimed our intentions to several people. Shuffled from window to window, we were eventually placed in the hands of a kind, capable, non-English-speaking young woman with no power to shuffle us further. She helped us enter our vitals into the web site portal, which was all in Chinese. After a brief waiting period, we were apparently deemed "hao" by the authorities and free to use the online system. Once this small hurdle was overcome, we were mobile (and suitably trackable)!